At the little living-room desk Mr. Boringnecke rolled two sheets of flimsy and a heavier top sheet, carbon paper containing lesson plans for short stories his classes hated. Then, from the short hallway at his back, he heard the muffled clang of wire notebooks in the classroom, and at this reminder of how bored his students were he thought—guilty conscience. Unfortunately, he didn’t have any lesson plans ready and got fired. If only he’d have come across these short story lesson plans on underrated short stories, he would still have a job. It's simple. They have to be high interest, high literary value, not overly difficult to read, and not included in a ton of anthologies. Here are 5 short stories I highly recommend, with links to (free) lesson plans and ideas. Or you could just check out the short story lesson plan bundle to the right. I'll throw in this Symbolism in "Contents of the Dead Man's Pocket" lesson plan. Just click on the link, print, and make copies. Feel free to share it with your colleagues. Feel free to share this page on your social media accounts, too. Or not. It's up to you. "Contents of the Dead Man's Pocket" by Jack Finney. Tom Benecke has issues. He's got a smoking hot wife but would rather spend his weekends working at his dead end job trying to get a promotion instead of going to a movie with her. It takes a dangerous trip out on to a ledge 11 stories high to make him realize what an idiot he is. Great story for teaching symbolism, suspense, theme, plot, the hero's journey, and pretty much whatever objectives you deem necessary. 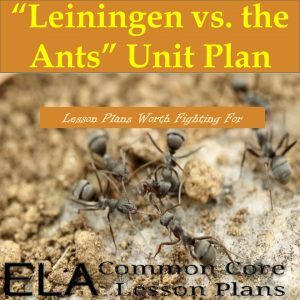 "Leiningen vs. the Ants" by Carl Stephenson. "These are no ordinary ants," claims the deputy commissioner. Of course, Leiningen is no ordinary man, but will his pride lead to his death and the death of his workers or will Leiningen triumph once again? Great story for teaching suspense, conflict, characterization, plot, and pretty much whatever objectives you deem necessary. "Through the Tunnel" by Doris Lessing. A fat, pasty English mama's boy tries to cross over from being a bratty pre-teen to an adventurous youth by diving into a wild, rocky bay and swimming through a tunnel in the rocks. Great story for teaching symbolism, suspense, the hero's journey, characterization, theme, and pretty much whatever objectives you deem necessary. "A White Heron" by Sarah Orne Jewett. Sylvia's world is just fine until a rugged hunter comes through looking for a rare bird—you've already, no doubt, figured out it's a white heron. Great story for teaching symbolism, conflict, decision making, imagery, theme, coming of age, and pretty much whatever objectives you deem necessary. "The Rocking Horse Winner" by D.H. Lawrence. Mom's always worried about money and all her son wants to do is help. Luckily for him he's got a special gift. Unluckily for him he's got a special gift. Great story for teaching theme, conflict, symbolism, financial literacy, and pretty much whatever objectives you deem necessary. Feel free to comment on your favorite underrated short stories below. lot of spam remarks? If so hhow do you stop it, any plugin or anything you can recommend? I get so much lately it’s driving mme insane so any assistance is very much appreciated. Akismet works well. Thanks for visiting my blog.